Spicy buffalo chicken seems to be a favorite of so many. It’s an easy way to dress up what can otherwise be plain, boring, and bland chicken. This slow cooker shredded spicy buffalo chicken dip is super easy, and sure to be a crowd pleaser. How easy is it, you ask? You basically toss everything in your crockpot, and get on with your life. Who doesn’t want that? This makes a great weeknight meal, or is perfect for tailgating or a party. 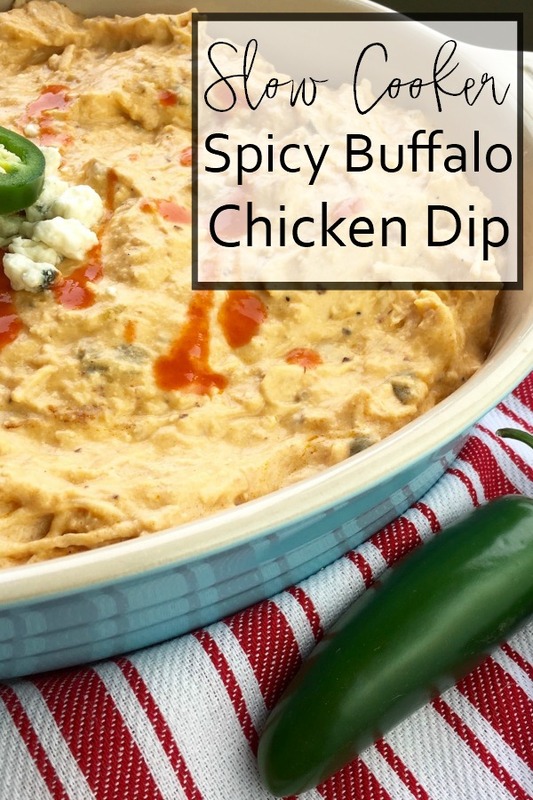 A delicious and oh so easy shredded buffalo chicken dip. It's so easy to make, and is sure to be a crowd pleaser. ¾ c. Frank’s hot sauce - adjust for your tastes. Season chicken breasts with salt and black pepper, to taste. Add chicken breasts, broth, celery, cream cheese, hot sauce, jalapeno pepper, and 4 oz. crumbled blue cheese to the crock of a 5 or 6-quart slow cooker. Cover and cook on high for 3-4 hours or 6-7 hours on low. 30 minutes before serving, remove lid and shred chicken using two forks. Add shredded Mozzarella cheese and stir to combine. Add cover and continue cooking until cheese is completely melted. Remove lid and garnish dip with remaining blue cheese, sliced green onions, or jalapeno, if desired. Keep warm and serve with celery stalks and carrot sticks. You may need to add a little extra chicken broth before serving for consistency. Of course, the spiciness can be adjusted to your palate. If you like eating things that melt your face off, kick it up a notch or two. If you’re a lightweight (raises hand),you may want to tone down the spice. 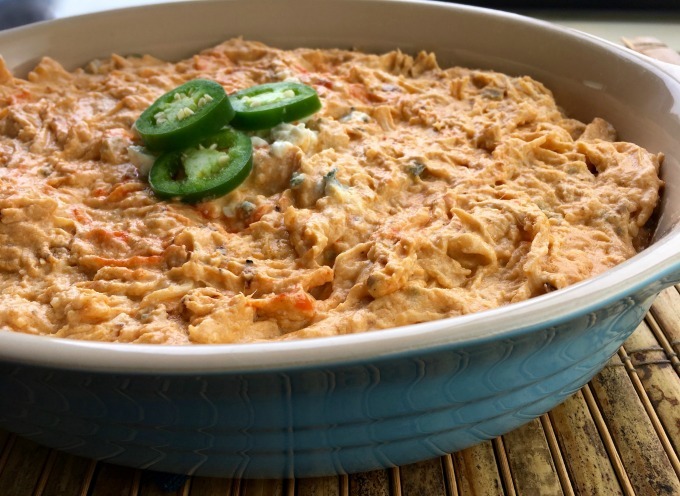 This slowcooker buffalo chicken dip pairs beautifully with a good beer. An American pale ale or IPA is the perfect counterpart to the spicy buffalo chicken flavors. And if you really want to get fancy, try it with a Michelada. Tell me – will you be trying out this recipe? Maybe serving it at your next tailgate?